After more than a two-year wait, the ATF has finally restored the use of the Form 1 for electronic submission.This development has raised the hopes of all manufacturing enthusiasts that some much-needed efficiency will start to improve processing times for tax stamps. It has been a long slog for the last two years, with wait times ballooning up to over 12 months due to the backup of applications received in the run up to the effective date of the 41F regulation. Recently, however, there has been a lot of progress in processing that suggests future optimism. Form 4 applications are becoming routinely returned approved within 7-8 months and with the restoration of e-filing for the Form 1, there is good reason to think that the Form 4 may not be far behind. To understand how we got to this point, it is important to take a quick look back at the changes to the tax stamp application process over the last few years. On July 13, 2016, the 41F regulation went into effect, which changed the application process for those applying for a tax stamp with a gun trust. 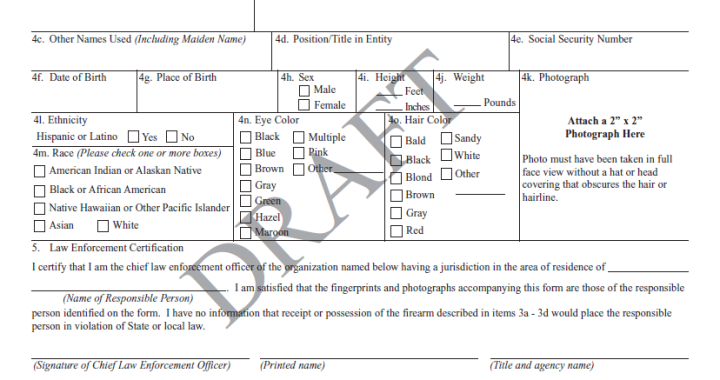 Previously, if you had a gun trust, you could avoid having to supply the ATF with photos and fingerprints, as well as being able to avoid having the CLEO (Chief Law Enforcement Officer) sign off on your application. 41F did away with the CLEO signoff requirement for all types of tax stamp applicants (individual route and trust route) but made the application process for individuals and trusts the same in that everyone has to submit fingerprints and photos for a Form 1 or Form 4 tax stamp. Due to the problems inherent in scanning in fingerprint cards and the necessary infrastructure costs that would incur, up until now, all Form 1s and Form 4s have been required in paper form. It was widely thought that the main obstacle in restoring e-forms had to do with the post-41F regulation requirement that fingerprints be submitted with each tax stamp application. As anyone who has turned in a Form 1 or Form 4 in the last few years is aware, the ATF currently asks that 2 old-fashioned fingerprint cards be included for each responsible person whenever someone applies for a new item. The paper card requirement has presented a challenge for many people simply because local police departments have long since adapted to the times by scanning in their fingerprints electronically. As a result, many precincts do not even stock the necessary paper or ink. This sparked a number of class 3 dealers to start providing the classic FD-258 cards and designating an employee to roll customers prints to reduce the barriers to suppressor purchases. It appears, for now, that the ATF is circumventing this problem by sending out a cover letter to the applicant upon receipt of the Form 1, asking that the physical cards be included and mailed back within 10 days of the application. Another potential hurdle is the Form 5320.23, or the Responsible Persons’ Questionnaire. This document is not currently set up as an eForm, so individuals who are using a trust will need to print out a copy for each responsible person with a photo attached, scan it, and attach the file to the Form 1 to be e-filed. The fact that the 5320.23 will still remain a paper form surely suggests that processing will remain slower than is ideal. Now that the e-filing option is once again active for the Form 1, what does the process look like? The eForms login can be found at this link: https://eforms.atf.gov/EForms/ You will need to register in order to access the system. Once you log in with your username and password, scroll to the Form 1. Once you choose the entity that is applying for the Form 1 (individual, trust, corporation, etc. ), and read through some instructions, you will be prompted to answer questions that will auto-populate into your Form 1. If filing as an individual, a digital photo of yourself must be uploaded in to the application. As soon as the Form 1 has been submitted, a cover sheet with the control number of the application will be mailed to the applicant. Two fingerprint cards must be mailed back to the ATF using this cover sheet within 10 days of Form 1 submission. There are some additional steps for those e-filing with a trust. An entire copy of the trust, with any amendments included, needs to be scanned and uploaded into the system. The Form 5320.23, the Responsible Persons Questionnaire, will need to be printed, filled out, signed, and scanned back into the system for every Responsible Person (RP) on the trust. A digital photograph of each RP needs to be attached to the 5320.23 before it is uploaded. Similarly to the individual route, a cover sheet will be sent to the applicant so that fingerprint cards for all RPs can be mailed back in to the ATF within 10 days of Form 1 submission. We can all remember fondly a time when Form 1s and Form 4s were both eForms and approvals came back within 3 months. It is unlikely that this new development will return us to those glory days, but it is a step in the right direction. Although several eForms for dealers and those dealing with estate transfers have been available for some time, the ATF is still working on bringing back the eForm 4. It is unclear why the Form 1 is once again available and the Form 4 has been held back. Both forms suffer from the same component requirements and have to go through similar processing on the examiner side of things. It is possible that the ATF is simply testing out the e-file version of the Form 1, as it has traditionally appealed to fewer people than the Form 4. This might be a clever approach, since every new development from the ATF, once posted on the internet and disseminated into the blogosphere, floods their examiners with calls and applications. A truly momentous advance would be enabling fingerprint cards to be digitally scanned at the time they are taken. Once that has been completed, we should start to see much better processing times for tax stamps.